CEA-LIST, a CEA Tech institute, recently set up a startup called Isybot to develop and commercialize the institute's most powerful command-control and actuator solutions for the collaborative robotics market. At our research partner DFKI, Professor Dr. Martin Ruskowski succeeds Professor Dr.-Ing. Dr. h.c. Detlef Zühlke as head of the "Innovative Factory Systems" research department at the German Research Center for Artificial Intelligence (DFKI) in Kaiserslautern and also as head of the former Institute of Production Automation at TU Kaiserslautern (PAK), now renamed the Institute of Machine Tools and System Controls (WSKL). Professor Ruskowski holds a professorship in the department of Mechanical and Process Engineering at the Technical University of Kaiserslautern (TU KL), where his major research focus is on industrial robots as machine tools, artificial intelligence in automation technology, and the development of innovative control concepts for automation. All equipment and machinery in the factories of tomorrow will be networked: Machines will have the ability to communicate and exchange data among themselves. Robots will continue to play an ever greater role in the world of Industrie 4.0. In the future, they may even replace traditional machine tools is some application situations, for example, in the milling of special components. "A priority of my work at TU Kaiserslautern and DFKI will be to improve the fitness of robots for demanding mechanical processing tasks. The new technologies that result from our research will provide more flexibility to companies and, ultimately, serve as a jobs motor in Germany," said Ruskowski in describing his new responsibilities. Vicomtech, one of GraphicsMedia.net's founding members, participated in ITS European Congress 2017 in Strasbourg (France). Dr. Oihana Otaegui, Director of Intelligent Transport Systems and Engineering, participated in two official sessions. The first one was entitled “Driver Status Monitoring using Computer Vision” and was presented under PR01 – Training needs on new technologies for fleet managers and drivers. The second one was called “inLane: Lane Level Navigation Application”, and was presented under SIS16 – Exploiting computer vision and GNSS applications for ADAS and digital cartography. This congress is defined as the biggest event with the ITS sector. The ITS Congresses (European and World) consist of three main areas: Congress, Demonstration, and Exhibition. Participating in these three areas offers a unique opportunity to show and explain the latest technologies and services, with a slightly different focus for each. 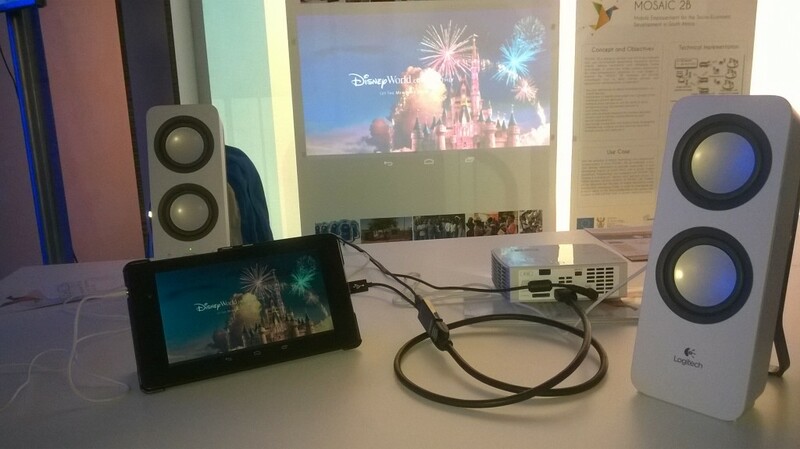 From 20th to 22nd October 2015, the ICT2015 event took place in Lisbon, Portugal. Under the organization of the European Commission, the ICT2015 event presented the new Commission policies and initiatives with regard to Research & Innovation in ICT. Overall more than 6000 delegates participated in the event. The European Commission was represented at highest level by the Commissioners Oettinger (responsible for Digital Economy and Society) and Moedas (responsible for Research, Science and Innovation), and the Portuguese President of Republic chaired the opening ceremony! During the event, conferences, networking sessions, parallel sessions and an exhibition with about 150 exhibitors took place. MOSAIC 2B was one of them! MOSAIC 2B booth was installed in the International Cooperation Village and was showcased as an example of successful cooperation projects with non-EU countries. There, the MOSAIC 2B partners demonstrated the project and presented the main outcomes. A video prepared for dissemination actions was also permanently screened, highlighting the MOSAIC 2B in use during field experiment and the participant’s testimonies. 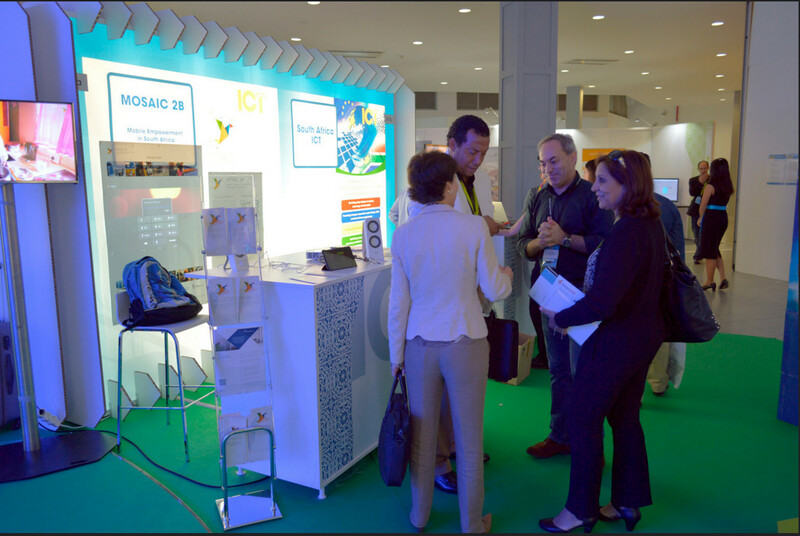 A large number of ICT2015 delegates visited the MOSAIC 2B booth and get informed about the project, congratulating for the achieved results and making comments about potential areas for future exploitation.